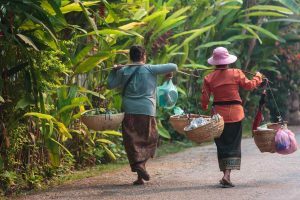 These days, Luang Prabang is better known for French café culture and an increasingly cosmopolitan dining scene than it is for Lao cuisine. But writer and photographer, Mick Shippen is having none of it. When in the languid riverside town, he opts for northern soul food. There’s something deeply reassuring about northern Lao food. From a restorative breakfast bowl of steaming khao soi noodle soup to the peppery flavours of or lam buffalo and vegetable stew, and herb-rich sai oua sausages, this is food that lets you know all is well with the world. And as the sun sets in Luang Prabang, is there any better way to induce an early evening endorphin rush than with a plate of sin savan, sun-dried beef and jaew bong chili paste? I think not. 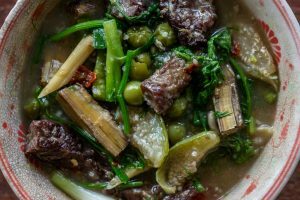 Northern Lao cuisine first received the attention it deserved in the early 80s when Alan Davidson, the British ambassador to Laos from 1973 – 75, published The Traditional Recipes of Laos. 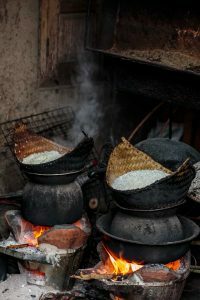 The book, which documented local ingredients and cooking techniques, was significant because it included a collection of recipes by the chef at the royal palace, Phia Sing. Born in Luang Prabang in 1898, Sing had three notebooks full of recipes, many of which were for northern dishes. After he passed away in the late 60s, Sing’s wife gave the notebooks to the then Crown Prince in the hope that the precious archive would one day be published. 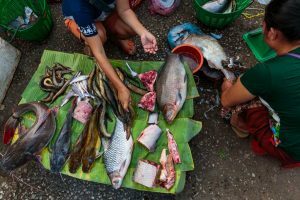 It was during a conversation with Davidson, who was researching his book Fish and Fish Dishes of Laos, that the Crown Prince handed over two of the notebooks (the third had alas been lost), which he photocopied and eventually published. Beautifully illustrated with line drawings by local artists, The Traditional Recipes of Laos is published by Prospect Books in the UK. Although it has since changed hands, the company was originally founded by Davidson and remains one of the most important publishers of historic and more idiosyncratic books about food and food culture. The food of northern Lao is rich and varied. Here’s a taster of some of the dishes you are likely to find in Luang Prabang. 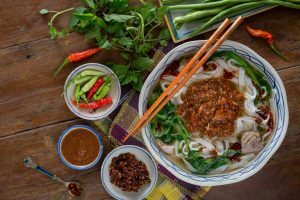 Ignore butter-rich croissants and crisp baguettes at your hotel; breakfast in Luang Prabang is all about khao soi, a delicious noodle soup served at open-fronted shophouses and street stalls. A light, bright, flavoursome meat stock is ladled over bootlace-wide rice noodles topped with a tomato, pork and fermented soy bean mixture, reminiscent of a bolognaise sauce. For the breakfast of champions, scatter with fresh coriander, spring onions and pickled vegetables, mix in a generous spoonful of roasted chili paste and enliven with a squeeze of lime juice. So, you are comfortably seated in a restaurant overlooking the Mekong, the sun is setting, and you’ve asked the waiter for a Beerlao and a bucket of ice. In Luang Prabang, the mere mention of ubiquitous amber nectar should trigger a reflex action causing you to add, “and sin savan jaew bong, please.” Jaew bong is a thick paste made with dry roasted chilies, garlic, galangal, shallots, sugar, salt and fish sauce. 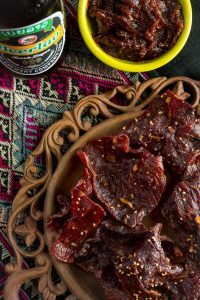 The ingredients are pounded until smooth and cooked low and slow, with the addition of strips of buffalo skin, until heady with spice and aromatics. Spread on sin savan or ‘heavenly sun-dried beef’, jaew bong delivers an assertive kick of chili heat and complex layers of flavour that make it one of the ultimate beer snacks. 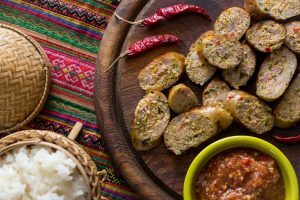 Every country has its sausage, and Lao is no exception. Wandering around the streets and markets of Luang Prabang you will undoubtedly see this northern-style pork being grilled on small charcoal stoves. Each cook has their own recipe, with additions to minced pork that include varying amounts of lemongrass, spring onions, shallots, coriander, kaffir lime leaves, chilies and black pepper. Khai pen is made using chlorophyta spirogyra, edible algae that grows on the rocks in the fast-flowing tributaries of the Mekong. It is harvested and processed into dried sheets from November to January. 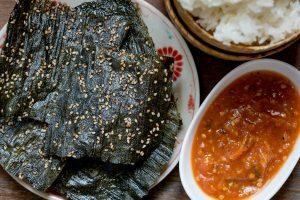 The paper-thin sheets are flash-fried and served with jaew mak len, a spicy chili and tomato dip. Khai pen is one of the foods included in the Ark of Taste, a catalogue of food products and ingredients maintained by the Slow Food movement to safeguard edible biodiversity threatened by industrial agriculture, environmental degradation and homogenization. Khai pen was nominated to The Ark of Taste by chef Ponpailin Kaewduangdy of Doi Ka Noi, a Vientiane restaurant renowned for traditional Lao cuisine using local, seasonal ingredients. Or lam is best described as the signature dish of Luang Prabang. Traditionally made with smoked buffalo meat or beef, this stew includes apple and pea aubergines, long beans, mouse ear mushrooms, lemongrass, chilies and a wide variety of herbs including dill. A key ingredient is mai sakarn or pepperwood that imparts a peppery heat, similar to Szechuan. Or lam is thickened with broken sticky rice. This classic dish of lemongrass stuffed with pork, glass noodles and herbs is a Lao favourite. 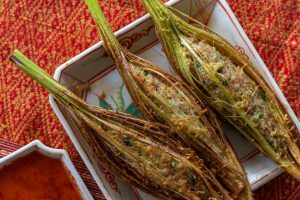 Traditionally, a lemongrass stalk is cut lengthways so it can be concertinaed and filled with the mixture, although the chef at renowned 3 Nagas restaurant in Luang Prabang opts to fold it over a ball of pork. Round or long, oua hua si khai is first steamed to infuse the meat with lemongrass flavours, then dipped in beaten egg and fried. Severed with a spicy dipping sauce, it’s a ‘must-try’ dish while in Luang Prabang. Lovers of local flavours can take home more than memories of their time in Luang Prabang. 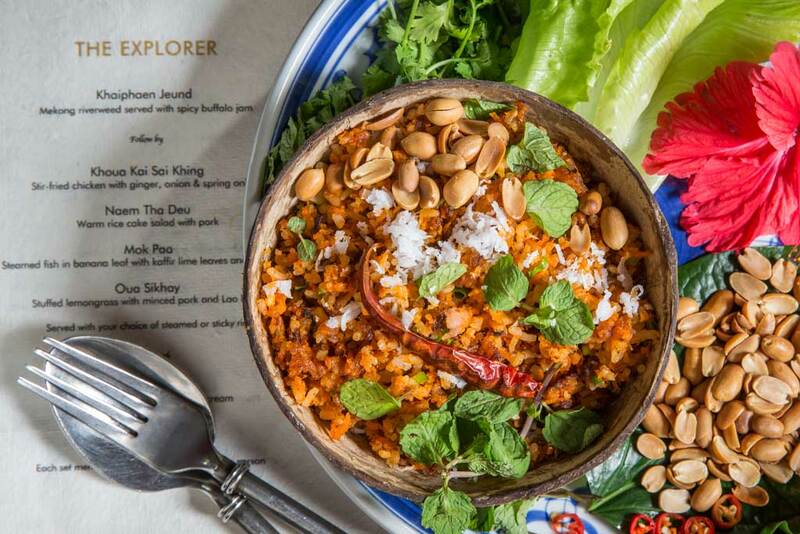 Chefs at the luxurious Sofitel Luang Prabang share the secrets that enable you to create restaurant quality Lao cuisine back home, and you don’t have to be a guest to take part. Each class begins with an early morning tour of the local fresh market accompanied by the chef who introduces local produce, before returning to the hotel for breakfast at the Governor’s Grill. 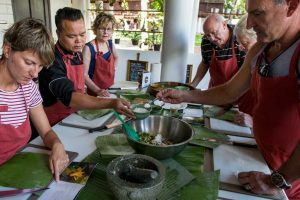 Foodies keen to master Lao techniques learn to cook a fabulous four-course meal with dishes which can include delights as yor khao, fresh spring rolls, oua hua si khai, lemongrass stuffed with pork, mok hed, mushrooms steamed in banana leaf parcels, and other favourites. Unlike many classes that provide students will individual workstations, Sofitel Luang Prabang invite participants to gather around a central kitchen island. It’s a collaborative hands-on experience where aspiring chefs get to make new friends, share stories and create delicious dishes together. The class, which includes a recipe booklet, ends with lunch at the Governor’s Grill. Classes are available on Tuesdays and Fridays from 8 a.m. – 12 p.m. and costs $35 per person including breakfast, lunch and soft drinks. Visit Sofitel.com for more information. Private one-on-one classes can also be arranged. Other Lao cooking classes in Luang Prabang are available at Tamarind (tamarindlaos.com) and Bamboo Tree restaurant, both on Kingkitsarath Road by the Nam Khan river.